Disclosure: Mail4Rosey did not receive any form of compensation to help promote this giveaway and is not responsible for prize delivery. My kids and I love to sit on the couch and watch the birds come to our bird feeder. We have a tall & narrow one that hangs from a mounted hook on an ending beam of the porch roof. That particular location keeps the squirrels and other critters around here from getting into the bird food. It works like a charm, but it's hard to tell how much bird seed is left in there because there's just a teeny, tiny peek window. I would love to have a bird feeder like the one featured here that has such a big viewing space! A big thanks to Bill from Holiday Contest and Sweeps for bringing the readers such a fun giveaway (and just in time for warm weather!). See his review below. Our feeders are nothing like as glamourous as this one - but we get hours of fun out of it. I am sure the lucky winners of these will 'waste' rather a lot of time bird watching and neglecting other chores. Just so you know you're at my show. And THAT'S the most beautiful bird feeder I've ever seen. Like a 5 star restaurant. 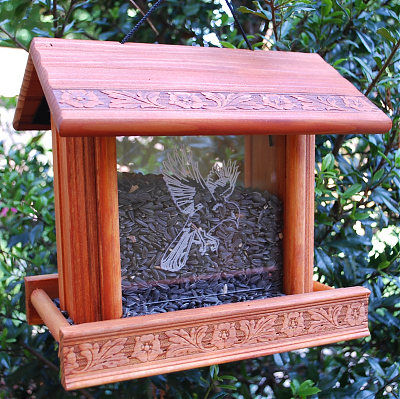 I love bird feeders and used to have them at my other house. I need to get some here now. 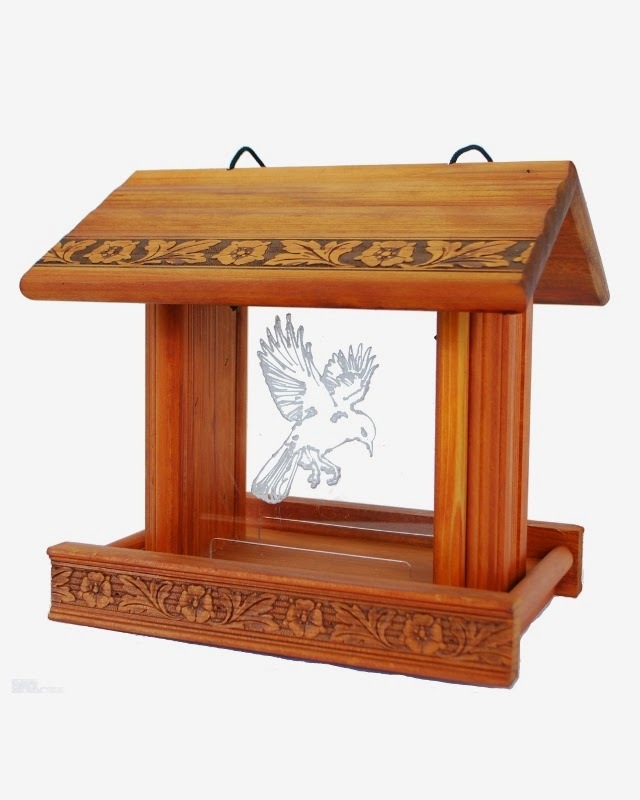 That feeder is a bird watcher's delight. I wonder if the birds feel like they are pulling up to a 5 star restaurant???? I just read Blue's comment. Seems he had the same idea.... Funny. Okay, I entered this giveaway. An awesome feeder. What a beautiful bird feeder! It must be like going to the spa for the birds! It's pretty, but I probably will never get around to regularly buying bird feed. I might buy it once, the birds will get used to it, then when the bag runs out, I won't get back to filling it. As a result, I'll end up killing birds who had become dependent on me for survival. I'm not ready for that kind of responsibility. The feeder is a work of art. With the songbirds around it, it is amazing. 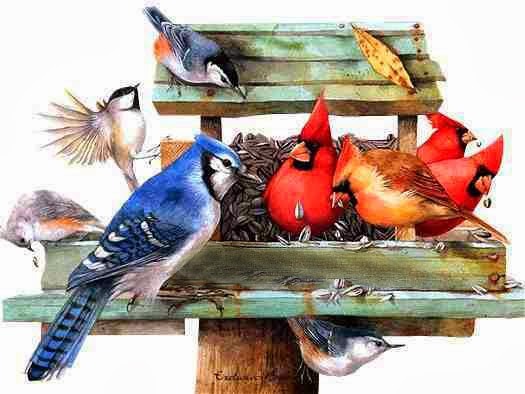 It is a beautiful feeder! That's really pretty! We don't have a big tree for a feeder just yet. Hi Rosey .. that is just delightful to see .. such a fun present - I wouldn't mind having one over here .. I might keep my eye open ..
That bird feeder is super pretty! I'll be looking for one soon as our two broke over the winter. That's a very nicely designed bird feeder. That's so pretty! I maybe can get a feeder now. We have 1 tree big enough. We tore all the HUGE trees down when we move. 1 was too big for the front, and taking up the sidewalk, and the other we just didn't like. thank you for the giveaway opportunity my sweet friend. Big hugs! !